Calling it the “most fuel-efficient” Corolla since the car’s debut more than 50 years ago, Toyota says the hybrid is projected to net 50 mpg when it goes on sale next year with its completely gas-powered brethren. The new powertrain system combines a 1.8-liter inline-four gas engine with two electric motors for a combined 121 horsepower, and it’s all run through a continuously variable transmission. Toyota says the battery pack’s smaller and flatter, which allows it to be packaged under the rear seats instead of the trunk, allowing for a split-folding seat back to boost cargo space. What’s unique for the hybrid trim, save for the badges, is a set of 15-inch aluminum alloys, as well as a 7-inch display screen in the instrument panel that shows off the speedometer and hybrid system battery charge status. For gear heads looking to observe all the mighty power of their Corolla hybrid, Toyota notes you’ll still be able to dial up a tachometer to observe the engine rpm. 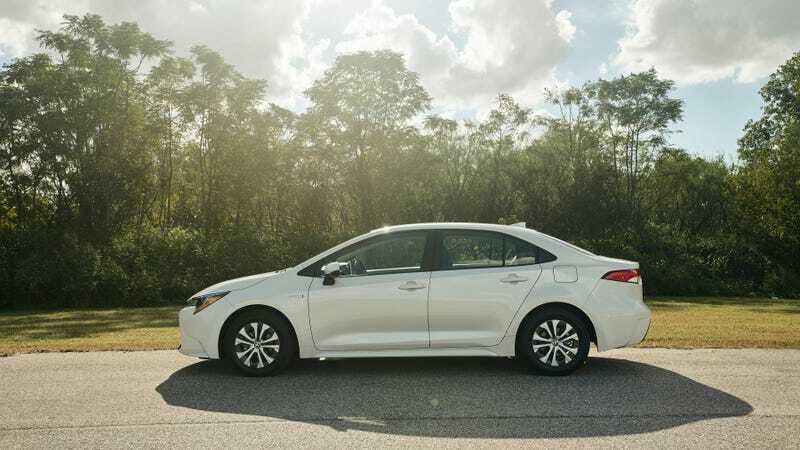 Beyond that, the available tech mirrors what’s on the regular 2020 Toyota Corolla, including Toyota’s Safety Sense 2.0 system, which come standard on the car. There’s an eight-inch touchscreen, Apple CarPlay, in-car wifi, radar guided cruise control, lane-tracking, pre-collision assist, sign recognition, and automatic high beams. Toyota almost surely knows how much the hybrid will cost, but just isn’t saying at this point because this is how you “lengthen” the news cycle when you have nothing that’s news besides the actual car. It’ll probably cost about the same as the last Corolla. The Corolla hybrid goes on sale this spring.